CGTalk | Cool things in Modo no one knows! Cool things in Modo no one knows! Is there a way to limit the depth in which object components are chosen? For example, i have a scene with multiple pieces of geometry. If i select a face of an object, that is in front of another object, modo will select faces from both objects, and this is something that i don’t want. Its like there is a strength/depth setting, but i dont know what it is. Is there a way to fix this? i want introduce you to paint normal maps within modo. At the moment there´s no directly function to do this but it is possible! First i make a flat Polygon 1m in Y Direction and 1m in X Direction. Reset Camera Positions to “look” at front of that poly. Put that normal map into image synth or something else to make a seamless texture. Use that seamless texture normal map and use it as image ink to paint. For testing create a primitive…i think a sphere is good. Create a new image with resolution 1024 x 1024 or higher and change the output to normal. I hope i didn´t forget anything because i´m not sitting in front of modo. Holding cntrl 3 gets you a popup menu where you can select several tool panels. They then disappear when you move your mouse off of them. They all bring up different tool menus. I’m finding it very handy. Anyone have any more tips? Anyone have any more tips? I’ve already learned some great tricks from this thread. Would love to learn more. Cntrl - tab gives you quick access to basic modeling commands. Try using this keyboard shortcut file posted in the Lux forum - http://forums.luxology.com/topic.aspx?f=32&t=67693. Very useful. Thanks, abgrafx3d. Great file to have for reference. I second that abgrafx3d, Great keyboard layout. Press Numeric-1 for Top view - press it again for Bottom (toggles back and forth). Awesome tutorial, thanks for posting! alt + mmb rotates the camera along the Z axis. Excellent for orienting yourself when trackball wont’ get you the view you need. Right clicking a component or component selection will bring up a popup menu with a list of operations you can run on it. This is great for the operations you use less often and you’re not familiar with the hotkey for it, or for operations that don’t have a hotkey assigned like the bridge tool (you could make a hotkey too ofc.). The tool pipeline is an amazing and often overlooked resource. Here you can make your own tool presets and save them out as your own custom tools. You can stack tools, falloffs, action centers, etc. In the render view, you can left click anything to select it’s material in the material editor. Similarly, you can create a material in the material editor and drop it onto an object in the render view to assign it. You can also drag and drop images from the image panel directly on an object in the render view to assign it as an image map on the material that’s already assigned to that object. If no material is assigned, it will create one. You can use the sculpting tools for modeling (smooth, push, etc.) in order to manipulate wider areas of your model or simply relax some vertices. Now, I actually had a question, and hope no one minds me asking it here, but I felt guilty doing so without contributing, and also this whole forum seems so tidy I din’t want to start a new thread. Modo seems to always import objects (especially when using goz) as subdivision. This can be pretty hard on my system when I’m sending over a 100k poly item to use as a reference for building an accessory or something similar. I’ve looked through the manual and help files, preferences, etc, but never found an option to import as a polygon object instead of sub-d. It can always be turned into a poly object after the fact, but modo struggles when it’s trying to subdivide to 10 million polys on import. Sometimes I have to wait a good 5-10 minutes just for everything to resolve itself before I can hit the tab key. Is there a way to slide one mesh over another in modo so that the one mesh is shrinkwrapped over the other? And are there ways to have collision detection? 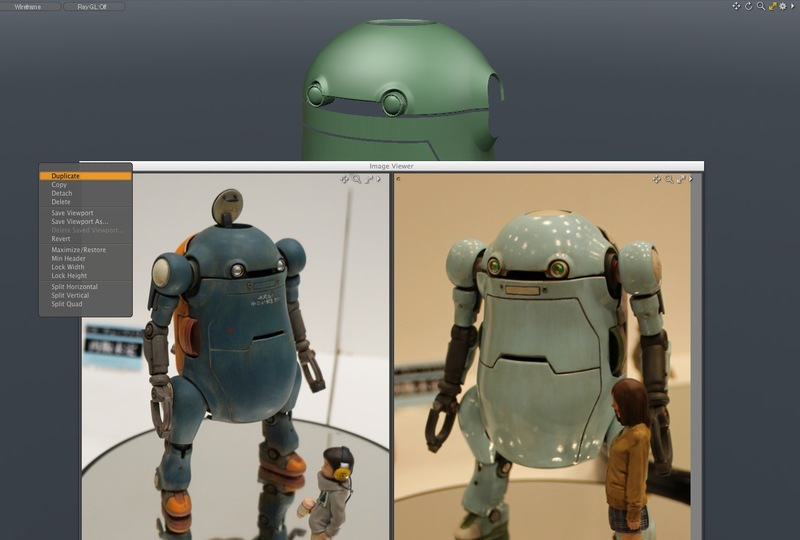 Modo has a great image viewer. ^ Very useful for modeling, rigging, ect. when stuff just keeps getting in the way.